Interested in an intensive academic English language program at Drew University? Information and application materials are available at INTO Drew University. Two year Pathway Programs are also available for students who want to combine intensive language study, academic skills development, and academic coursework at Drew while working towards the completion of a Bachelor of Arts degree. Pathway Programs are available in a variety of disciplines including Business, Humanities and Social Sciences, Pre-Engineering, Sciences, and the Arts. For more information on our 2+2 Pathway, please visit INTO at Drew. If you have questions regarding admission to our INTO programs, please contact INTOadmissions@drew.edu or 973-408-4964. Welcome to INTO Drew University! Drew is more than a place to earn your degree- it is the beginning of a richly rewarding life that betters you as it betters society. Our challenging liberal arts curriculum, close student-faculty relationships, and commitment to borderless education will allow you to take learning out of the classroom and into the world with you. Below you will find resources to help guide you on your journey towards successful completion of the INTO Drew program. Whether you are a student in the Academic English program, Pathway program, or both, or are seeking to matriculate into Drew upon completion of your specific program, INTO Drew will provide you with assistance and incredible university resources to make your experience in the United States a memorable one! Attendance Standing Academic English students are required to attend class regularly and on time. A student who attends less than 80% of classes for one or more courses per semester is not in good attendance standing, and will face attendance probation. Attendance Probation If a student does not meet attendance required (80% attendance) in one or more courses, the student is placed on Academic Probation during the next semester. A student on Attendance Probation who does not meet attendance required in one or more courses in the next semester will face Dismissal (see policy below). Dismissal Policy Dismissal means that you have been expelled from your program and can no longer be a student at INTO Drew or Drew University. Students who are dismissed are denied all of the privileges of being a Drew student. International students who are dismissed must immediately leave the United States or transfer to another university. All Academic English students enrolled at INTO Drew will be assigned to an Academic Coach, who will assist you throughout the duration of your program on study skills, outreach in the university community, general questions about life in the United States, and more. Think of your Academic Coach as more than just academics- your coach will be there to support you in all aspects of university and American life! You and your Academic Coach will use this course planning worksheet to discuss your progress in your program and how to continue on through the Pathway program (should you wish to do so) and how to prepare yourself for matriculation into the university. 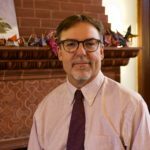 First-semester students in Academic English will be enrolled in “University 101,” a 6-week course designed to engage the student into university life at Drew and ways to get involved. Topics vary each week, including: travel advising, meet & greet with Conversation Partners (see program details below), academic policies, and many more. Taught by the Student Services Coordinators with INTO Drew, the Academic English students will become better prepared students in their first semester at Drew University! One of the many highlights of the Academic English program, each student is carefully partnered with a native English language speaker (a full-time Drew student) and will meet weekly in the semester to have informal conversations to improve and build upon conversational skills practiced within the classroom. The student pairings can discuss any topic they like- from the hottest show on Netflix, to the history of Drew University, the Conversation Partners Program will enhance the Academic English student’s vocabulary, as well as foster new friendships and connections to the Drew community. Once students complete their first semester, they can elect to join Book Club, a program sponsored by INTO Drew Student Services, which is a graduated version of Conversation Partners. In its inaugural semester, students read Hunger Games, and will continue with Animal Farm. Please review the policies provided in the link below, which will serve as your guide towards successful integration into the Drew academic community, as well as life in the American university setting. Any questions about these policies should be directed to your assigned Academic Coach or to the Office of Academic Services, located in Brothers College. All Pathway students enrolled at INTO Drew will be assigned to an Academic Coach, who will assist you throughout the duration of your program on study skills, outreach in the university community, general questions about life in the United States, and more. Think of your Academic Coach as more than just academics- your coach will be there to support you in all aspects of university and American life! Your Academic Coach will also assist you in planning out your coursework in your Pathway program, keeping in mind your future career plans and involvement on campus, and finally work with you on matriculating into Drew after your first two years in the Pathway program. You and your Academic Coach will use this course planning worksheet to discuss your progress and what future semesters will look like, along with help from your Academic Advisor. First-semester students in the Pathway program will be enrolled in “University 101,” a 6-week course designed to engage the student into university life at Drew and ways to get involved. Topics vary each week, including: travel advising, work authorization, academic integrity, and many more. Taught by the Student Services Coordinators with INTO Drew, the Pathway students will become better prepared students in their first semester at Drew University, meeting professors from across the college, directors and advisers of various departments on campus, and learning from each other about what it means to be a successful college student. A partnership with the Madison community and INTO New York at Drew, interested Pathway students will be paired with families of this wonderful community to help acclimate them to American culture and family life. Learn more about this exciting program! Please read carefully through the financial requirements for I-20 eligibility in order to successfully present all documentation and proof that you can financially sustain yourself during your program of study at Drew University during the I-20 process. We’re excited to welcome all new students to Drew University! 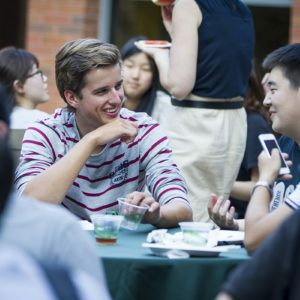 International student orientation is the opportunity to meet important stakeholders at Drew to make the academic and social life an unforgettable experience. New student orientation is mandatory for all incoming students, whether in the Academic English or Pathway program. Students upon arrival will be administered an English exam, Math placement exam (if in the Pre-Engineering or Natural Sciences Pathway), as well as receive the student ID card, university login and email address, and make all final payments with our Finance Manager. Alongside these administrative tasks, our students will have the chance to bond with university officials and other new students in a variety of activities sponsored by INTO Student Services. These activities include: meet & greet in the residence hall, bowling with the INTO Drew team, and shopping! Drew’s academic calendar will be critical in the planning process for the international student in traveling home or to another country for all breaks that the university observes. This calendar has dates that are set for the next five years. It is important that if you are thinking about traveling out of the country, you must speak with your Academic Coach, as well as complete this form to let Student Services know your plans. The academic calendar dates are to be utilized by both Academic English and Pathway students. Travel Form I-20 The I-20 should have both your signature and a travel signature authorization from Dina Cenicola, INTO Student Services Coordinator, Stephanie Bias, SEVIS Coordinator, or Laura Arthur, Director of Student Experience. This signature can be located on the second page of the Travel I-20. Your I-20 should also reflect “continued attendance” once the add/drop period has passed in the College of Liberal Arts. Do not throw away any of your I-20s! They will be important for work authorization (see Employment & Practical Training). Passport Your passport needs to be at valid at least 6 months in the future in order to return to the United States. If your passport is going to expire within this 6 month period, you must make an appointment at your home country’s consulate in the United States to receive a new passport. Most consulates will request an online application to be completed before an appointment can be made, so check your country’s consular website for more information. Valid F-1 Visa Most students will have a U.S. F-1 Visa valid for 5 years, maybe 10 years, but it is important to keep track of its expiration date. If your visa is going to expire soon, or is already expired, please make an appointment at the United States Consulate in your home country to renew your visa. Ask your Academic Coach questions about important documents to have at this appointment. Travel Visa If you are looking to travel out of the country (somewhere that is not your home country), you must find out if you need a travel/visitor’s visa. Visit the country’s consular website to see if a visitor’s visa is necessary, as well as all documentation you will need to support you entry into the visiting country, as well as re-entry into the United States. You should also view the travel & visa renewals info for all questions related to your visa and traveling. Congratulations on the completion of your first two years in the Pathway program, as well as at Drew! This is an exciting time for you- matriculating into Drew University comes with all the same benefits you received in the Pathway program…a world-class liberal arts education. By using this Completed Courses for Major worksheet, work with your Academic Coach in the final Spring semester of the Pathway program to discuss what courses you have taken thus far in your intended major, what your career goals are, and how to plan your future semesters if you are considering a double major, minor, or both!